"This is my favorite recipe. I have had this recipe since I was in high school. All my friends love it. Hope you enjoy it!" In a medium bowl mix flour, baking powder, baking soda, salt, and cinnamon and set aside. In a separate bowl cream margarine and sugar, add eggs and mix until smooth. Stir in milk and mashed banana and mix well. Fold in flour mixture into the liquid ingredients until combined. Bake in a preheated 350 degree F (175 degrees C) oven for 25 to 30 minutes. I doubled this and I think if I would double it again I would use three bananas and less cinnamon. The cinnamon really overpowered the banana taste. Nice and moist though! Delicious- caution not to bake 30 minutes... mine were on the well side at 28 minutes. I added mini chocolate chips and my kids loved them. Bake on middle shelf in the oven! Great muffin recipe. This has made my favorites list. I added nuts, and a hint of almond extract. Nice and light, and made great mini muffins! 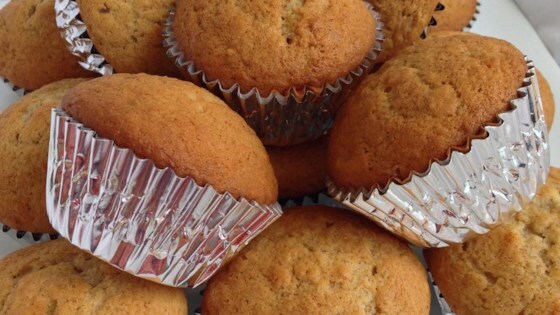 I've been looking for the perfect banana muffin recipe for a long time -- now I've found it! I also substituted half of the butter with tofu - it's incredible! The muffins were moist, as promised, but they are pretty bland and don't taste much of banana.